Happy Friday, everyone. Are you ready for the weekend? I sure am. Let’s start the day out with a funny . . . . I got this from a good friend of mine, KM. She’s got a great sense of humor and thought this would make a good Friday Funny. Oh boy, she was right. I chucked bigtime at this. 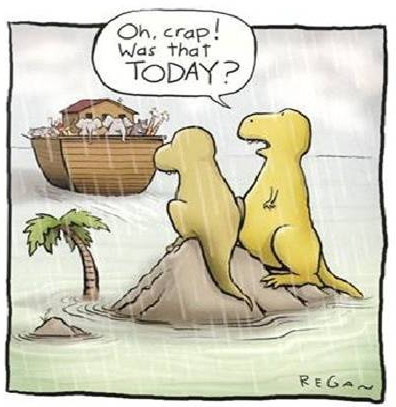 This entry was posted in Uncategorized and tagged Dinosaur Jokes, Friday, Friday Funnies, Lynn Rush, TGIF by Lynn Rush. Bookmark the permalink. HI you guys. I LOVED this little cartoon, it was so funny. I’m glad you guys stopped by. Hope your Friday treated you all well. See ya later! Thanks! that’s perfect for today, I’m still smiling! I rec’d this from a friend at church. The funny part is, we were at a gathering after that and she brought it up, asked if I liked it. Here’s the kicker, though… she wanted to know what kind of animals they were that missed the boat. I said… uh… the dinosaurs? You know… that’s why they’re extinct? And she said, “OOOHHHH, the joke’s even funnier now!” And she was the one who sent it to me in the first place. We had a good laugh together, twice, over this one! Happy Friday! Enjoy your weekend Lynn. Finally some 60 degree temps here in Charlotte this weekend.